Why do we call it historic Canons Park? Well, in the early 1700s, it was the centre of a grand country estate owned by the Duke of Chandos. His palace did not survive for long, but was rebuilt on a smaller scale in the 1750s and is now part of the North London Collegiate School. Some other remains from that time include the walled garden (now the George V Memorial Garden), the Temple, and the Bothy. 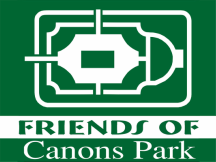 If you wish to find out more on the history of the area, click on A full history of Canons Park. We also have an interesting article on how the Duke of Chandos came by (and lost) his fortune in the first half of the 18th Century, written by a local resident.